We’re well into the new year, and these first couple of weeks have been great for us. There has been another national tv appearance for ‘Tijd voor Max‘ (see below) and some memorable shows at the ‘Kleine Komedie’ theater in Amsterdam, where we played alongside wellknown Dutch artists to present the forthcoming album ‘De Supersonische Boem‘ featuring songs written by Annie M.G. Schmidt and Harry Bannink. Many of these songs are very wellknown here in Holland and have been populair for many years. If you want to hear us sing in Dutch, here’s some footage of the soundcheck (see below). We got some great response for both our tv appearances and the shows at de Kleine Komedie. We’re confident this exposure will open some new doors for us. 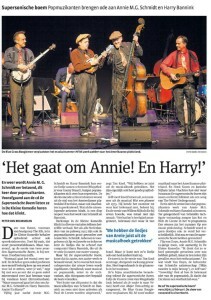 Last Saturday we travelled all the way to Nantes, France to do a Hillbilly Boogiemen show there. The place was sold out and we got a great reception. And what a wonderful welcome! We sure hope to be back there some time in the future. Thanks folks of the Western Country Friends, for showing us a wonderful time! 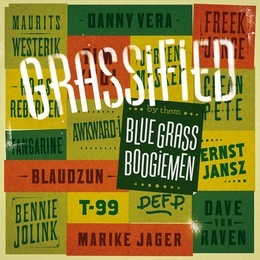 If you want to know where we’ll be performing, please check our website www.bluegrassboogiemen.nl and look under ‘Tourdates’. We hope you can make it to one of our shows!